Heading into 2018, the Xfinity Series was stacked with competition — more so than even 2016 or 2017 with returning veterans, fresh babyfaces entering the next chapter of their career and even Cup drivers making the leap back down to be competitive in the top preliminary division. Series regulars won a whopping 20 races in 2018, up six from 2017. Early in the season, Monster Energy NASCAR Cup Series drivers dominated, though the first 10 races of the season were won by 10 different drivers. Brad Keselowski was the first repeat winner, not coming until Memorial Day weekend at Charlotte Motor Speedway. Ironically enough, Tyler Reddick kicked off the season with a win at Daytona — the closest margin of finish in NASCAR history (.0004 seconds) over his JR Motorsports teammate Elliott Sadler. We’ll get back to that ‘ol No. 9 team in a bit. 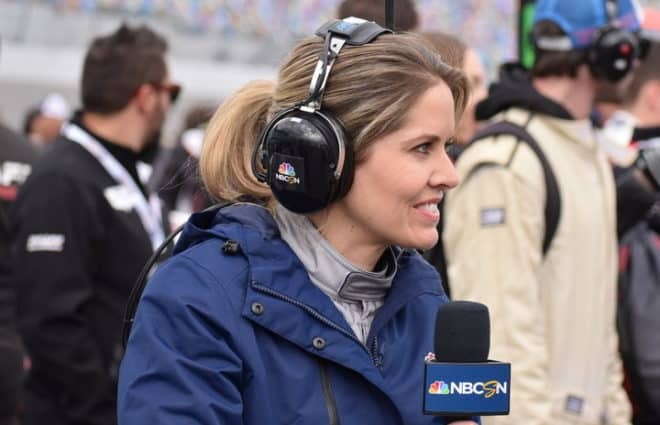 Cup drivers strung off five straight wins, but Ryan Preece put that to an end at Bristol Motor Speedway in mid-April, though it was a Dash 4 Cash race, meaning Cup drivers could not compete. At Richmond Raceway, Christopher Bell notched his first win of the season, as Justin Allgaier won at Dover. Spencer Gallagher split their wins, earning his first career Xfinity victory at Talladega Superspeedway, but was suspended by NASCAR for violating its substance abuse policy the next week. The No. 23 team was still eligible to compete for the owners championship during the postseason, but Gallagher missed much of the summer months in the Road to Recovery program. Allgaier was the first Xfinity driver to grab a second victory in 2018 — on Father’s Day nonetheless — in front of his daughter Harper. But it was Bell that went on a hot streak in July, winning at Kentucky, New Hampshire and Iowa in three consecutive races. Prior to Bell, the last time a driver won three consecutive races was Dale Earnhardt Jr. in 1999. The No. 7 team and Allgaier’s hot streak continued throughout the regular season, as he won three more times, two of which were on road courses (Mid-Ohio Sports Car Course and Road America), while living out a childhood dream and kissing the bricks at the famed Indianapolis Motor Speedway. With the victory, Allgaier clinched up the regular season championship, earning him an additional 15 playoff points. In his second of three races at Chip Ganassi Racing, Ross Chastain was triumphant, leading 180 of 200 laps. 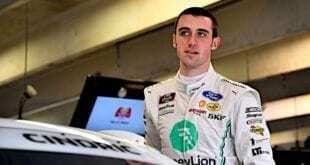 That clinched the Florida native a spot into the playoffs, though he exceeded his equipment at JD Motorsports and would have made it on points, whether he won or not. When the postseason began at Richmond in mid-September, it was like a crop of new drivers turned up the wick for a shot at the title. While Allgaier was dominant in the regular season, he crashed out at the short track, barely making it into the Round of 8. 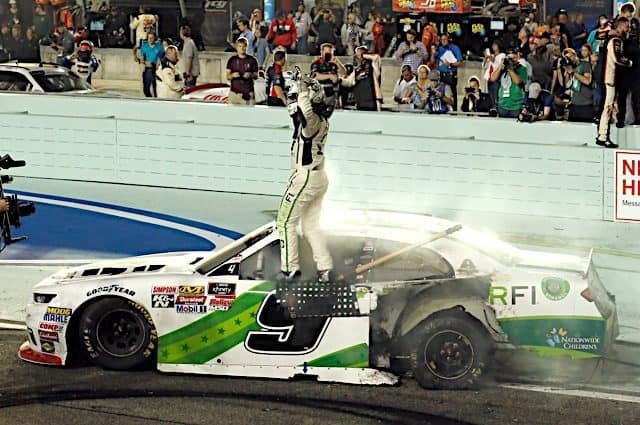 But it was in the Round of 8 where Allgaier’s quest of a championship went up in smoke… literally at ISM Raceway when his brakes caught fire. Between Richmond, The ROVAL and Dover, Chastain, Ryan Reed, Brandon Jones and Ryan Truex were eliminated from the playoffs. Meanwhile, Bell caught fire, winning two of the three races. In the Round of 8, Allgaier and Bell had terrible luck, as the No. 20 car crashed out at both Kansas Speedway and Texas Motor Speedway, making Phoenix a must-win. He did just that after starting in last. John Hunter Nemechek won his first series race at Kansas, putting the No. 42 Chip Ganassi Racing team into the Championship 4 on the owners side. Cole Custer was victorious at Texas, putting the No. 00 in the running for the championship. Phoenix belonged to the aforementioned Bell, adding Daniel Hemric and Reddick to the Championship 4 on the drivers side. But Austin Cindric, Matt Tifft, Allgaier and Sadler’s quest for the title came to an end. Homestead was an odd race. Custer dominated the first half, leading 95 laps, though Reddick found something — the wall — where he wheeled the No. 9 team to its second consecutive Xfinity title. The No. 00 team, led by Custer, won the owner’s championship, Stewart-Haas Racing’s first title in the series. However, he finished runner-up in the race and the drivers championship, as Hemric was third and Bell fourth. Arguably, the Xfinity Series was the most competitive racing throughout the duration of the 2018 season. With the five overtime finish at Daytona, Bell and Allgaier combining to win 12 races, five drivers having a shot at the regular season and a quarter of first-time winners, the 2018 season was great, and names were definitely made. Reddick was good when it mattered, that being the postseason. Sure, he won the season-opening race at Daytona, but didn’t get a second top-five finish until the 10th race of the season at Dover. His third didn’t come until Labor Day Weekend in Darlington. Entering the playoffs, Reddick was a darkhorse, but it his past success at Homestead played dividend, rim-riding the wall. The No. 9 team ended the season with a pair of wins, 20 top 10s, but just 184 laps led, the fewest an Xfinity champion has led since 1993, when Steve Grissom paced the field for 120 laps. Surprisingly, Custer only won once in 2018, that coming in the 31st race of the season. However, consistency was the name of the game for the No. 00 team, posting a series-high 26 top 10s. In nearly every category Custer improved from his rookie campaign in 2017, other than race wins. He posted 14 top-five finishes, doubling the amount from 2017, but had to rely on Homestead to lead more laps (389 this year to 301 this season). The No. 00 also won a series-high six poles and had the best average starting position of 5.9. 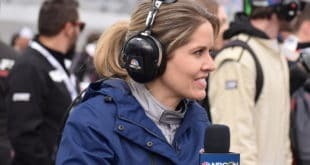 Custer will return to the Xfinity Series next year, again competing in the No. 00 for Stewart-Haas Racing. Expect him to be even better, as the team is adding Chase Briscoe to its driver lineup. Despite having 12 podium finishes, for the second consecutive Xfinity season, Hemric went winless in the No. 21 Childress ride. However, he was leaps and bounds better from his rookie year in 2017. The No. 21 won the pole for the first race of the season at Daytona. Fast forward nine months to Homestead, covering 33 total races and Hemric had 16 top-five and 23 top-10 finishes, leading 440 laps. But in 118 national touring races, the North Carolina drive has yet to record a win. But never fear, he will be jumping into the No. 8 (formerly 31) Cup car for RCR in 2019, replacing Ryan Newman. Expect him to battle Preece for Rookie of the Year. The only thing stopping Bell from an A+ is coming up short of the championship, but damn can this kid wheel a racecar. The No. 20 team ended the year with a series-high seven victories, setting a new benchmark for rookie drivers moving forward. Bell led a series-high 759 circuits, but coming up short of the title was a bit of a disappointment. He will be back in the No. 20 next year, and most definitely will be the favorite for the title. In his farewell tour, Sadler could never find Victory Lane, ending his career on a 72-race winless streak, dating back to September of 2016. But once again, the No. 1 team was consistently consistent. No, he didn’t make the Championship 4 for the first time since its inception in 2016, but Sadler had more top fives in 2018 (14) to 2017 (12), starting the season with 12 consecutive top-10 efforts. But as the season progressed, the No. 1 car didn’t have the same speed, though running in the top five in points for all 33 races. Look for Sadler to be coaching his children on the diamond in 2019, somewhere in the Emporia, VA, region. As 2018 progressed, so did Tifft in his first, and only season at Richard Childress Racing. 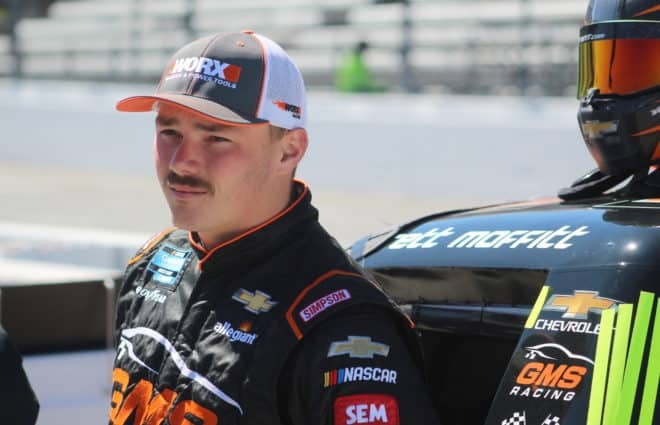 Tifft ended the year with six-top five finishes, including a runner-up at Road America, up four from 2017 — his rookie season in Xfinity. In the playoffs, he was above average, having a shot to win late at Phoenix, coming up just short. 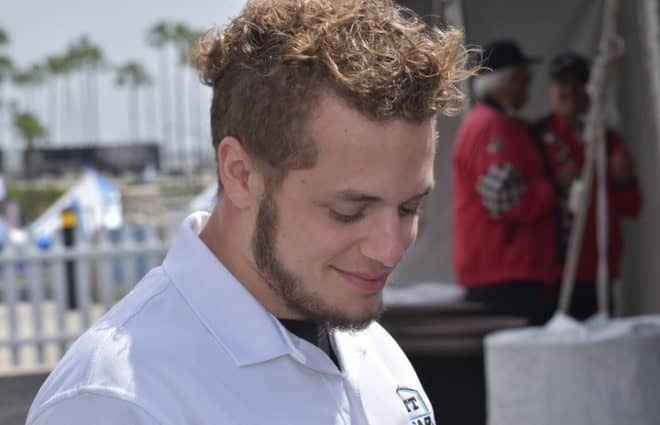 Add Tifft to drivers moving up to the Cup Series, as it was announced in late November he would be piloting a third Front Row Motorsports Ford in 2019. Finishing seventh in points doesn’t jump out as A-worthy, but five wins and the regular season championship sure does. 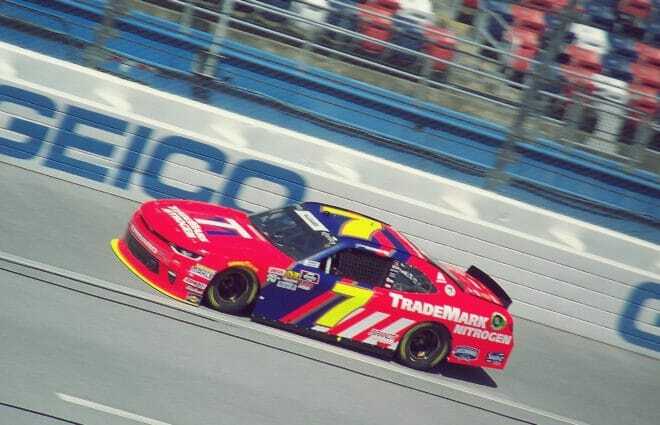 Allgaier posted many career-highs in 2018, including the alluded checkered flags, 17 top-five finishes and 741 laps led. But it was a dismal playoffs, averaging a 19.5 average finish in the first two rounds that kept the No. 7 team from competing for the championship at Homestead. Man, win #4 for the season at Road America today! ROAD AMERICA!! Can’t thank my crew, the guys at the shop & our sponsors for making this season the best I’ve ever had! We are going to carry this momentum & chase the championship! Incredible to drive such awesome stuff. Look out in 2019, because this team will be on a mission. You could argue that Cindric’s grade could be higher or lower, depending on how you view the rookie driver. Over the course of the season, Cindric upset a lot of other drivers, including Bell, Allgaier and Sadler, among others. But driving the No. 22 Team Penske during the playoffs, the 20-year-old proved his a good prospect. Cindric is signed on to be the full-time driver of the No. 22 car in 2019, and look for a more mature driver behind the wheel. The rookie ended the season with four top-five finishes over the final six races. Huge news today. Excited for everything on the horizon in 2019 with the 22 team, @Team_Penske and @moneylionracing, THANK YOU! For the third straight season, Jones went winless; albeit, this was the most competitive season he’s had — the way it should be when driving for Joe Gibbs Racing. Jones ended the season with 17 top-10 finishes, the same amount he had in 71 career races for RCR. He led a career-high 106 laps at Bristol in April, though crossing the finish line in sixth. Our team is heartbroken over the end result today at @BMSupdates but so many positives out of today! Looking forward to competing for the #Dash4Cash in @RichmondRaceway! The No. 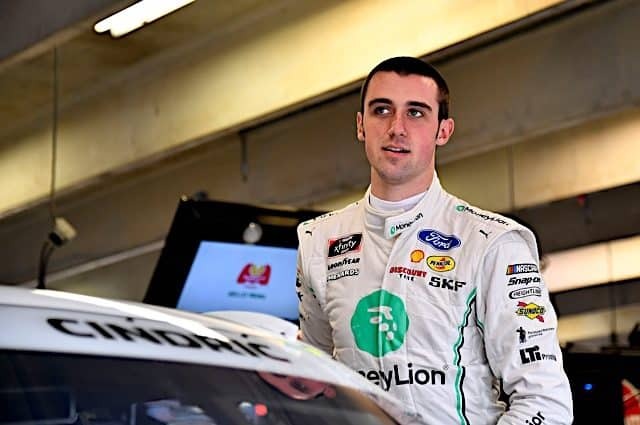 19 car will be occupied by Jones in 2019, as he signed a two-year deal when coming over. But with a bunch of Toyota talent in the lower series, he must perform even better in 2019. Chastain proved what he could do in good equipment, but maybe more impressively what he can do in average to below average rides. Because of his success in JD Motorsports No. 4 ride over the past five years, Chip Ganassi Racing put him in the No. 42 at Darlington, Las Vegas and Richmond. In those three races, he had one win, two top-tw0 finishes, leading 270 of 597 total laps. Chastain recorded an additional top five at Iowa with JDM, finishing the year with eight top 10s. He heads to CGR next season, where he will be among the favorites for the championship. For the fifth straight season, Reed had an average year in Roush Fenway Racing equipment, going winless for the first time since 2016, despite posting a career-high 10 top 10s. On the flip side, Reed led five laps all season long, none after race No. 13 of the season. He also finished a career-low 11th in the championship standings, with five DNFs. Reed’s future is unclear after Lilly Diabetes announced its departure from Roush Fenway Racing. However, he told Frontstretch at Homestead, he’s confident he will be back in a racecar. Truex got an opportunity of a lifetime in 2018, competing for Kaulig Racing, his first full year in the Xfinity Series. He made the most out of it. The No. 11 team finished the season with 11 top-10 finishes, more than the team did in its first two years of existence (2016 and 2017). Just one of those 11 came during the playoffs. 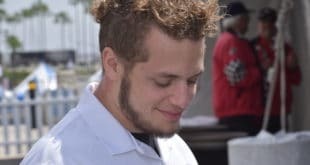 Truex will be replaced by Justin Haley in 2019, who is jumping up from the Camping World Truck Series. Not having a ride nailed down before Christmas is not unchartered territory for the New Jersey native.